We conservatively extend an ACP-style discrete-time process theory with discrete stochastic delays. The semantics of the timed delays relies on time additivity and time determinism, which are properties that enable us to merge subsequent timed delays and to impose their synchronous expiration. Stochastic delays, however, interact with respect to a so-called race condition that determines the set of delays that expire first, which is guided by an (implicit) probabilistic choice. The race condition precludes the property of time additivity as the merger of stochastic delays alters this probabilistic behavior. To this end, we resolve the race condition using conditionally-distributed unit delays. We give a sound and ground-complete axiomatization of the process theory comprising the standard set of ACP-style operators. In this generalized setting, the alternative composition is no longer associative, so we have to resort to special normal forms that explicitly resolve the underlying race condition. Our treatment succeeds in the initial challenge to conservatively extend standard time with stochastic time. However, the `dissection' of the stochastic delays to conditionally-distributed unit delays comes at a price, as we can no longer relate the resolved race condition to the original stochastic delays. We seek a solution in the field of probabilistic refinements that enable the interchange of probabilistic and nondeterministic choices. Markovski, J, D'Argenio, P.R, Baeten, J.C.M, & de Vink, E.P. (2012). 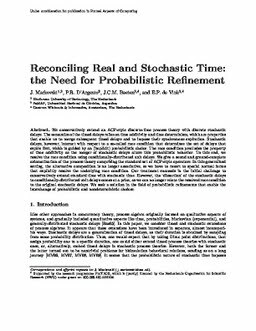 Reconciling real and stochastic time: the need for probabilistic refinement. Formal Aspects of Computing, 24, 497–518.